If you're anything like me, one mention of the word "Chocolate" and you start to salivate - looking expectantly around for the said sinful delight. Well - I'm pleased to say that this Double Chocolate Bundt Cake with Chocolate Ganache will not let you down. 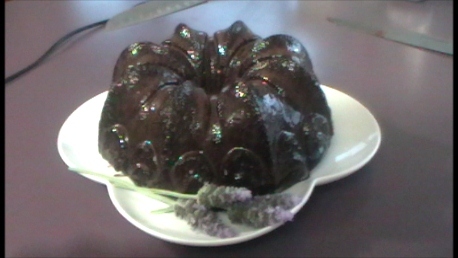 There are some Bundt Cake Tins available in Cake shops or even supermarkets, however the quality doesn't appear to be equivalent to the price being paid. The cake tin that I used was provided by Kitchenware Direct, and I am still amazed at how evenly the cake baked, and how easily it just popped from the cake tin. I was all set to say some prayers and give it a good tap - but none of it was needed in the end - I turned it over, and out she dropped. Melt 60 grams of the chopped chocolate over low heat, stirring constantly. Whisk oil and sugar until smooth. Add egg, and whisk until smooth. Add the melted chocolate and whisk until smooth and fully blended. In another bowl, whisk together the flour, cocoa, baking soda and salt. Add half of the flour mixture to the chocolate mixture, along with 1/2 cup of brewed coffee and 1/2 cup of buttermilk. Whisk until smooth. Add the remaining flour mixture, coffee and buttermilk and whisk until smooth. Pour batter into prepared Bundt cake pan, and bake for 45-50 minutes. Test the cake with a toothpick - it should come out with some small crumbs attached. Place cream in a small saucepan and bring to the boil on the stove top. Place syrup, butter and the rest of the chopped chocolate into a bowl, and pour the heated cream over. Leave to melt the ingredients for 5 minutes. Stir until all ingredients are well blended, and then pour the ganache over the cooled cake.